Taco Bell introduces the new Double Chalupa as their latest limited-time offer. 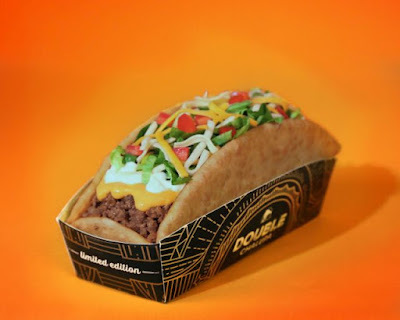 Reminiscent of the XXL Chalupa launched back in 2010, the Double Chalupa features an oversized Chalupa shell filled with a double portion of seasoned ground beef (versus a regular Chalupa), shredded lettuce, diced tomato, reduced-fat sour cream, warm nacho cheese sauce, and shredded three cheese blend. There's also a spicy version that throws on some jalapenos. You can find both the Double Chalupa and the Spicy Double Chalupa for $3.49 a piece at Taco Bell restaurants nationwide through the end of July. You can also get either version as part of a Big Box along with a Doritos Locos Tacos, a crunchy taco, and a medium fountain drink for $5.